Rain or Shine, Snow or Sleet..
Before leaving Boise, we obtained a mail box at a local UPS store and began transferring our mailing address to that box. When we are in a place that will accept camper mail, we call the UPS store and ask them to forward our mail. The process has worked very well – until a couple weeks ago. Two stops ago, we requested our mail. It came and we opened the large envelope with great anticipation – that happens when you only get mail every 2-3 weeks. We were very disappointed when every piece of mail belonged to another box holder. We called the UPS store to report the mistake and they assumed they had been doing two at a time and our mail had mistakenly gone to someone who was having mail forwarded to Yuma. They called the other people involved, and we waited, and waited and waited… Eventually they heard from the other people that they had not received any mail. Our UPS store then decided that our mail had stayed in the box in Boise all along. We were skeptical, but returned the mail that didn’t belong to us and asked that our mail be sent to Ehrenburg, AZ. Monday, there was no mail. The same on Tuesday and Wednesday. On Thursday, still no mail, which was a problem since we were preparing to leave on Friday morning. We called the UPS store and asked them to do a trace. The manager read the letter over the phone confirming that mail was delivered to Randy and Serene Williams on Monday. The other enjoyable event on this stop was a drive down to Yuma to see cousin Audrey. 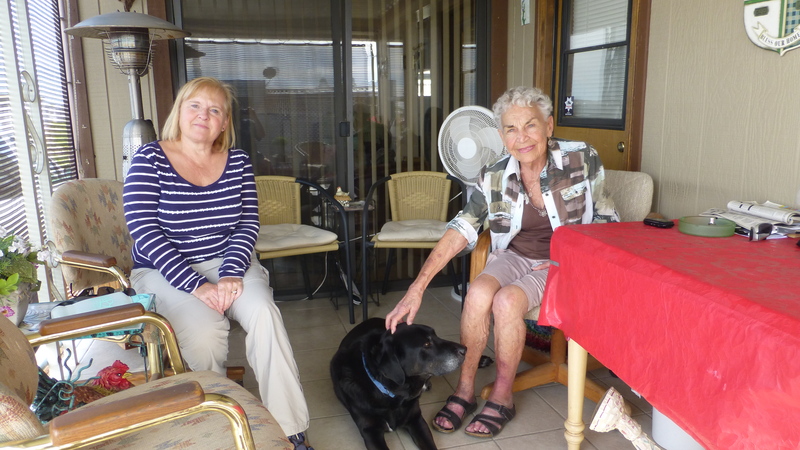 Audrey spends six months a year at an RV community in Yuma and has a great time. Her park has many activities, a golf course, a restaurant and is very appealing. Audrey drives around in her golf cart and has many friends there. We think we might come and hang out for a month if we are in the southwest next winter. Going to Yuma, we drove by the entrance to Yuma Proving Ground. This is a military facility where my father was stationed beginning in the summer of 1977. (From there, I attended Northern Arizona University, met Randy etc. etc.) 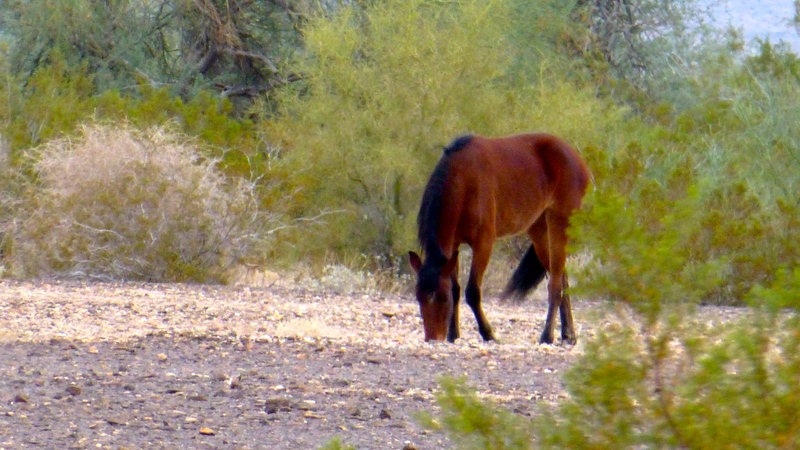 While living there we would occasionally see a few wild horses in the desert and I had told Randy about them on the drive south. On the way north, we were fortunate to see a small group near the road. 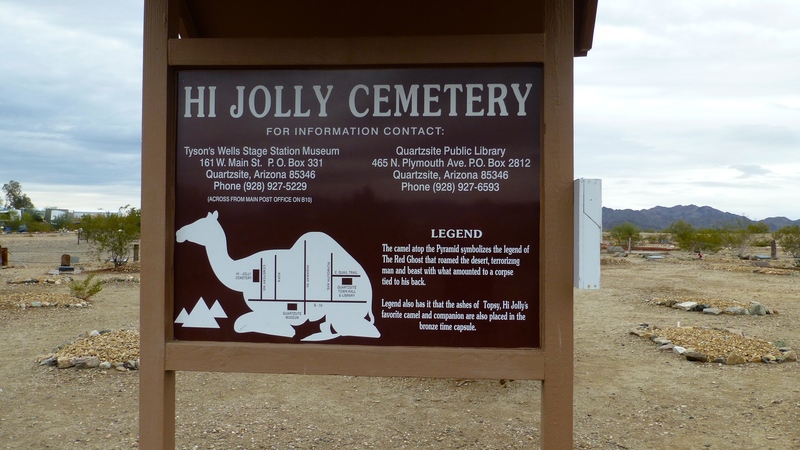 We also went to Quartzite, Arizona – a little town that is infamous in the RV community. Hundreds of thousands of RVs and RVers amass on Quartzite each January for a loose gathering. We came into the area after the event was officially concluded but still saw thousands of RVs parked out in the desert. It is one of those things that people say you should do at least once. Randy thinks so, but I’m not so sure. He may be out of luck since I do most of the planning! 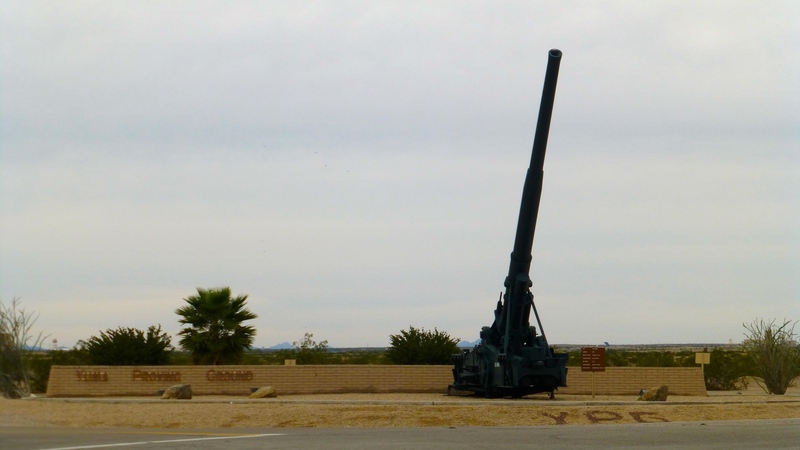 While in Quartzite we went to the one (and only) attraction listed on Trip Advisor. 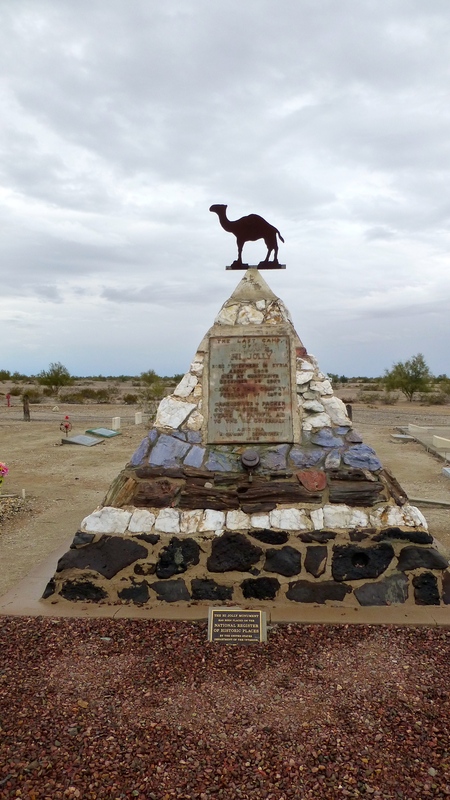 It is a memorial to Hi Jolly and the military’s experiment with a camel corps in Arizona during the mid 1800s. We plan to spend the next two months in Arizona. 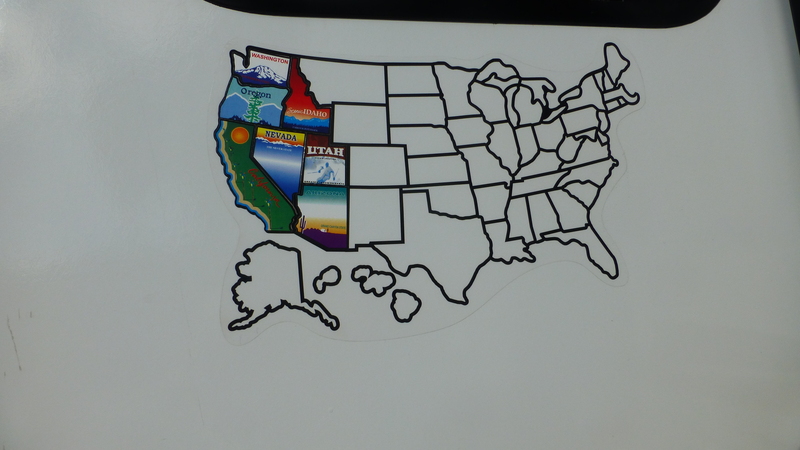 It was nice to be able to add another sticker to our map! Given that we will be close to Phoenix on Sunday, I suggested to Randy that we might want to get tickets for the Super Bowl – especially since the team I like, the Seahawks are playing a team he likes, the Patriots. He agreed that we should look and see. Tickets on the secondary market were $8500 a piece! No Superbowl tickets for us! Go Seahawks! 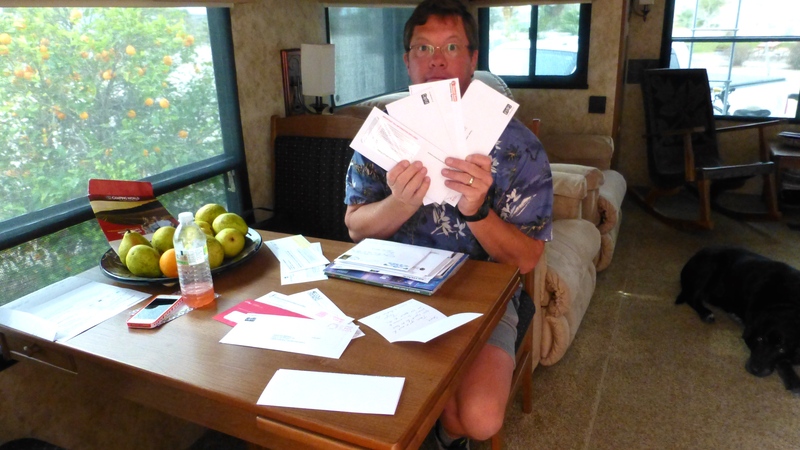 4 Responses to Rain or Shine, Snow or Sleet..
Quartzite RV Fest sounds like it might be a bit tame. Perhaps you should consider Burning Man in NV? Thank you for taking me on your journey. Love reading of your travels. Keep up the good work! Glad you enjoy the blog – especially when you get to read about your sis!